“My team goes above and beyond in everything they do! “They make every patient feel at home and take exceptional pride in their work. They ensure our day-to-day schedule runs smoothly and support me in all aspects of patient and customer care. I like the day-to-day interaction with our patients. It’s enjoyable to see their smiling faces as treatment progresses and how each person gains self-esteem! I provide chairside assistance during procedures, make appliances in the lab, and take impressions, X-rays, and patient records. I love working with Dr. Frels and our team because we work great together and always help each other out. We keep a positive attitude, which means a great environment for us and our patients. I share my life with my fur child, Harvey, who’s a Pit bull. He’s friendly and wonderful and makes my days bright. When I’m not working, I like playing with Harvey, watching sports, and outdoor adventures. I love interacting with patients and developing relationships with them. It’s great to see my friends grow as they achieve a beautiful smile! I meet with patients and parents to review financials, including insurance benefits and payment plans, and get all the paperwork in place. Dr. Frels is great. She’s a perfectionist who always does what’s best for her patients. 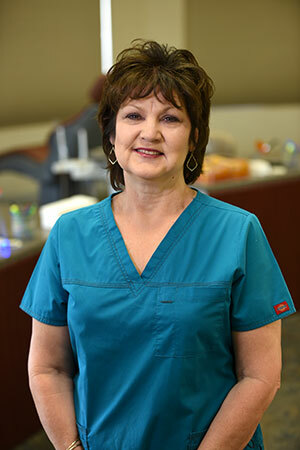 She and our team get along well: all of us support one another so our patients have the best experience and finish with amazing smiles. My husband Brandon and I married in June 2011. We have two young sons, Bainen and Bodie, who keep us on our toes! We live on a ranch in Cuero and love to fish, hunt, and play sports. Anything outdoors is good for us! Both boys play baseball and we’re huge Houston Astro fans, too. I like working with our patients and parents: helping them understand the financials and making treatment understandable. Watching each patient change, and become more confident with a new smile, is the best experience! I work on financial responsibilities and insurance claims. 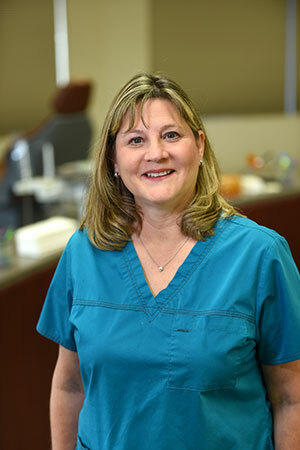 Dr. Frels is very detailed oriented and always recommends what she feels is the best treatment for each person. She is caring and kind, as are the team members, and that makes for a wonderful environment for all of us. I am happily married and have two daughters and two dogs. I love to cook, quilt, work in the yard, and travel. I like interacting with our patients and getting to know them and their families. It’s rewarding to see the end results of treatment and the smiles that accompany those results! I handle a range of office tasks, from working reception and welcoming patients to scheduling visits and assisting the financial coordinator. Dr. Frels cares a great deal about the appropriate treatment for her patients, and that sets a high standard of care for the staff. We are a caring team: like family to one another as well as to our patients. Professionalism + sincerity in care + a fun environment = a wonderful place! I love seeing the difference we make in our patients’ lives, not just with their treatment, but the one-on-one care we provide as we build beautiful smiles! I offer patient care, deliver braces and appliances, and assist Dr. Frels. I also make appliances in our lab, do iTero® scans, handle sterilizing tasks, and am the OSHA rep.
Dr. Frels and my coworkers are my family. I cannot imagine starting each day without them, and love how each of us is so dedicated and supportive of each other and our patients. I’m a Navy brat and former Marine. My husband Victor and I married in 2009. He’s the current USPS Victoria Postmaster. We have four children: Vic Jr., Cynthia, JT, and John-Michael. We have two naughty Bengal cats, a sweet rescue cat, and a dear Chihuahua, too. I am also a PIYO instructor and sometimes teach in my off time. I appreciate having personal contact with our patients and becoming their friend. I am one of the first people our new patients and families meet, and I work hard to make those interactions positive and helpful! I greet patients and check them in, schedule appointments, answer the phones, accept payments, and help wherever I’m needed. Our office is friendly and we’re a close-knit team. 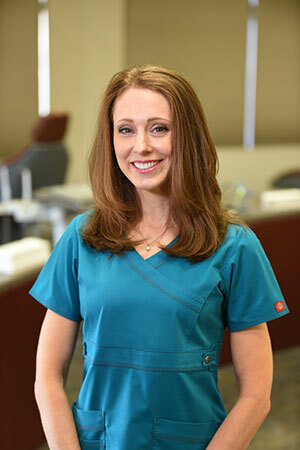 Dr. Frels is easy to communicate with and cares about her patients and staff. My husband John and I have been married for more than 35 years. We have two grown children. Son Jared is married to Kasey, and they have two precious daughters and live in Houston. Mackenzie, our daughter, is married to Colton and lives in Fort Worth. I also have a granddog, Hamilton, who is sweet and loved. I enjoy spending time with my family and precious grandbabies, as well as traveling and quality time in POC with family and friends. I like working with our patients: getting to know everyone and seeing them change from visit to visit. It’s exciting to see new smiles appear! I assist Dr. Frels with procedures, change wires, work in the laboratory, and sterilize equipment and treatment areas. I love working alongside these wonderful people who maintain a positive environment. We feel like a big family: Dr. Frels, our team, our patients, and their families! I will be getting married in early April 2019, so right now much of my time off is spent planning for the wedding! My fiancé and I have a fur baby: our German Shepherd, Kusa. We spend what free time we do have playing with him and enjoying our home together. I like building relationships with our patients and seeing each person become more confident and outgoing with a new smile! My days are spent in the clinic, where I take X-rays and impressions and provide chairside assistance and patient care. I also handle sterilization and stocking. Dr. Frels is a caring, skilled doctor and our staff is vibrant and bubbly. We have a great environment and our patients always know we are here for them. My husband Troy and I married in 2014. Together we have four children: Reagan, Connor, Colin, and Darian. Our family loves traveling and exploring new places. I have the pleasure of working with our patients from the very beginning of their treatment to the day their beautiful, new smile is revealed! During a new patient exam, I take X-rays and photos, document Dr. Frels’ diagnosis and treatment plan, and review the recommended treatment and financial options with the patient. Being involved in such a hands-on way, and knowing that our work has made a significant effect on a person’s life, brings me joy. I’ve been married for 33 years and have two beautiful daughters and four grandkids with hopefully more on the way! My husband and I enjoy working out together, going to Cowboys and Astros games, and traveling to tropical destinations. I love shopping with my daughters, spending time with grandkids and going to their sporting events, gardening, and am an extreme animal lover! I enjoy helping out around the office by checking on patients’ insurance benefits, filing charts, answering the phone, and any other tasks needed to help the office run smoothly. I joined this office in 2015; it’s been fun learning about all the different aspects of the dental and orthodontic field! I love watching our patients’ smiles transform over the course of their treatment. I am very fortunate to be part of this fun and energetic team. Everyone goes the extra mile to ensure that all our patients feel welcome and comfortable at our office. I have been married to my husband Jim for 29 years. We have a daughter and a son and love spending as much time with them as we can. Outside of the office, I enjoy working in my yard, reading, and volunteering at my church. My goal is to make our patients’ orthodontic experience as smooth, stress-free, and fun as possible! I’m with our patients every step of the way, from taking orthodontic records at the initial appointment to assisting with adjustments and finally, removing the brackets. Being a part of our patients’ smile journeys is so rewarding. It puts a smile on my face! Dr. Frels and our entire orthodontic team are like family. We each have something positive to bring to the team, and share a dedication to excellence in all that we do. Outside of work, I enjoy outdoor activities, DIY projects, and spending time with my two incredible daughters and fantabulous grandchildren!